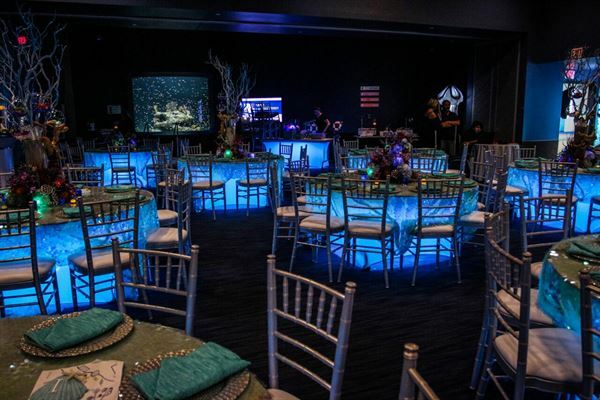 Incorporate the extraordinary into your special event at OdySea Aquarium, the largest aquarium in the Southwest! Have a party by the water or sip cocktails while gazing at fascinating sea life. From intimate receptions to elaborate, OdySea Aquarium provides a unique experience and lasting memories. Offering a variety of venue space options that can accommodate up to 2,000 people, your event can be customized to fit your vision and needs, and the guest list can even include an otter or a penguin! Site fees starting at $1,200 with a $55 food and beverage minimum per person. Food and Beverage is subject to tax and service charges. Enjoy an intimate dinner under the bustling and bright tunnel which offers an immersive tour through daily life inside Earth’s largest living structure, Australia’s Great Barrier Reef. Blu Culinary Creations nautical themed restaurant is the perfect backdrop for your event. Impress your guests with the African black-footed penguins and get to know these charismatic animals. Party with reef inhabitants such as the clownfish, banded butterfly fish and the magnificent sea anemone. Adore the whole OdySea penguin family. Our African black-footed penguins will create a buzz with their charismatic personalities and aquatic skill leaving your guests with a lasting impression. Great space for kid friendly events with multiple interactive elements to keep them busy. Amazing add on space to Rivers of the World and the Lighthouse Cafe´. Dine under the sea with an expansive view into a 200,000 gallon habitat featuring sharks, rays, and sea turtles. Introduce your guests to the resident Asian small-clawed otters and also enjoy creatures from the fascinating to the fearsome including piranhas and behemoth alligator gars in the Rivers of the World! Great space for strolling receptions or buffet dinners. Enhance your event with Bizarre & Beautiful area and enjoy the unusual sights of the flashlight fish, the king crab, and the giant Pacific octopus. Great space to expand from Deep Ocean Theater or use as Cocktail Reception.